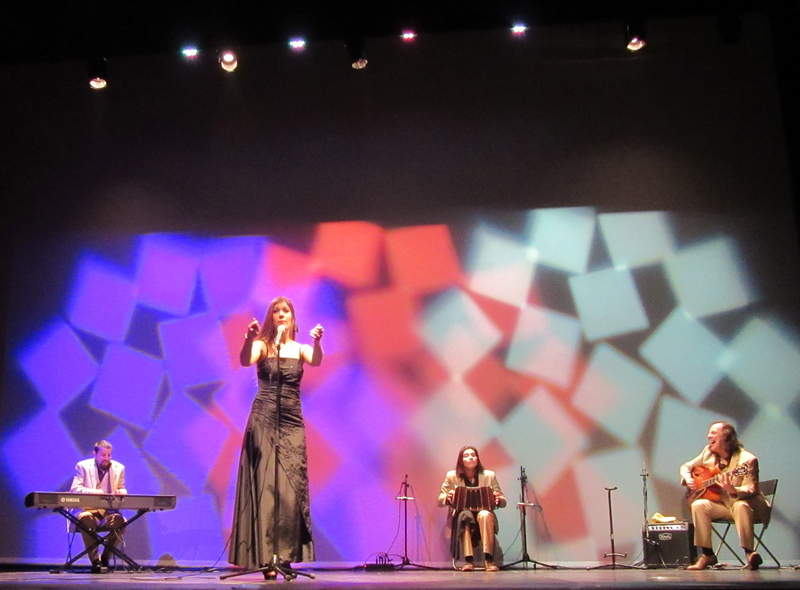 BUENOS AIRES … CUANDO LEJOS ME VI is the title of a show by Mariel Martínez & La Porteño Tango Trio currently in Madrid to promote a CD of the same name. I have admired Martínez’s recordings since listening to her 2010 Perfume de tango. The album includes a compelling interpretation of “Luna curiosa,” a song whose music, by Argentinian rocker Litto Nebbia, and lyrics, by the late Tito Reyes, who sang for Anibal Troilo, laments the loss of tango in its familiar barrios, a take on the ironic theme, in tango itself, of its own death. Martínez has taken the song as a signature, with a twist that leavens the grief with the hope of rebirth. It also defines what is engaging about her recorded voice, the ache of loss, a gulp of want unfulfilled, but only as yet. The past is mourned, but desire, as that which seeks its own extinction, has, at times, a desperate confidence in the future. This is a distinctive vocal quality, like sleep resisted for fear of what might be missed, that is present, too, on the CD Esos otros tangos, which was nominated for a Gardel award in 2014. Martínez sang “Luna curiosa” on the night I saw her show in Madrid, although it is not included in her new collection. She described it, astutely, as a recent tango that sounds like and calls to mind a classic. Indeed, when I first heard it, I assumed it was an obscure, but striking, older song. Esos otros tangos was exactly that: those other tangos by the writers and orchestras we know from their more widely played, sung, and danced-to compositions. It is, as a result, an album both new and nostalgic, fulfilling the desire in her voice while lamenting the loss of the thing desired. Buenos Aires … cuando lejos me vi, judging from the show and her banter about it, shifts the sense of loss and desired rebirth from history to geography, framing its songs, regardless of particular themes, with those of exile and homesickness. Death and rebirth are, roughly (for time and space are not really separable), replaced by departure and return. This is a familiar Argentinian, and tango, subject, the plaint of a country of immigrants that became one of exiles, both political and economic. Martínez alluded to the fact that she is, in a way, one of them, as she came from Argentina to Spain following the collapse of 2001. I approached her show with considerable interest, given the qualities I value in her voice and that it would be my first chance to hear them live. She is, I was glad to find, a strong stage performer (the videos of her shows don’t, to my mind, capture her strengths). The voice in person is not as rough edged emotionally as on the recordings, but rounder, even-keeled, open and smooth, without a catch in it. Her mouth is visibly supple, with lips that flare out, at rousing moments, like the mouth of trumpet. She can deliver a lyric with great rapidity, like stones skipping over water. The effect when you see her do it borders on virtuoso. That the format is show rather than concert is significant. It means that she appears in theaters, most likely with proscenia, at a certain distance from the audience, with whom she may or may not be able to make visual contact. The tone is one of elegance and suavity, the figure she cuts, a tall woman who favors long gowns, commanding. The staging is a little sparse, with just Martínez and the trio – Alejandro Picciano, guitar; Mattias Picciano (they are father and son), bandoneon; Federico Peuvrel, piano – and, in selected numbers, two dancers. She delivers the customary banter, bits of tango history, mutual joshing with the musicians (especially the guitarist), and appropriate pathos. She prefaces the softly lilting “Yo no sé que me han hecho los ojos” by taking Ada Falcón’s side in the split with the composer Canaro, reputed to have led to the legendary singer’s vanishing from public view in the 1940s. There are rear projections throughout, some of them decorative, others conveying a sense of place or recapping Martinez and the band’s travel and career together. The last gives the show a celebratory dimension. The attenuated desire of her recorded voice is not, to be clear, completely absent. It is good to hear it when it emerges, but you don’t resent its absence. The glamor was a little unexpected given the edgier pleasures of Martínez as a recording artist, but has its own value, and adds variety to her persona and a breadth to her craft. She remains one of my favorite contemporary singers of tango to listen to, and she is well worth seeing as well. For information on the show and CD, click here.